Now on to the food! 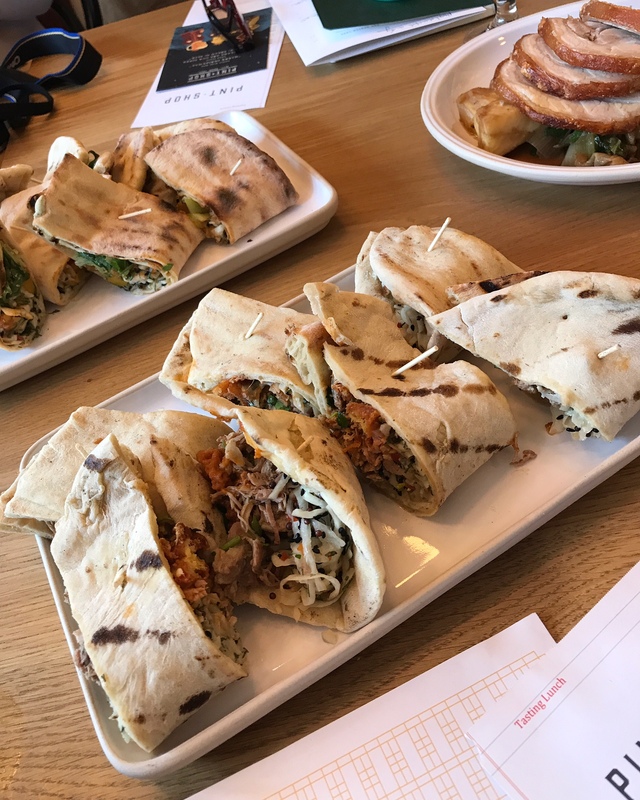 We sampled a few bites from the majority of dishes on the new menu. Most of my photos don’t demonstrate how each dish would normally be presented as some items were cut into smaller portions or placed on one big plate. 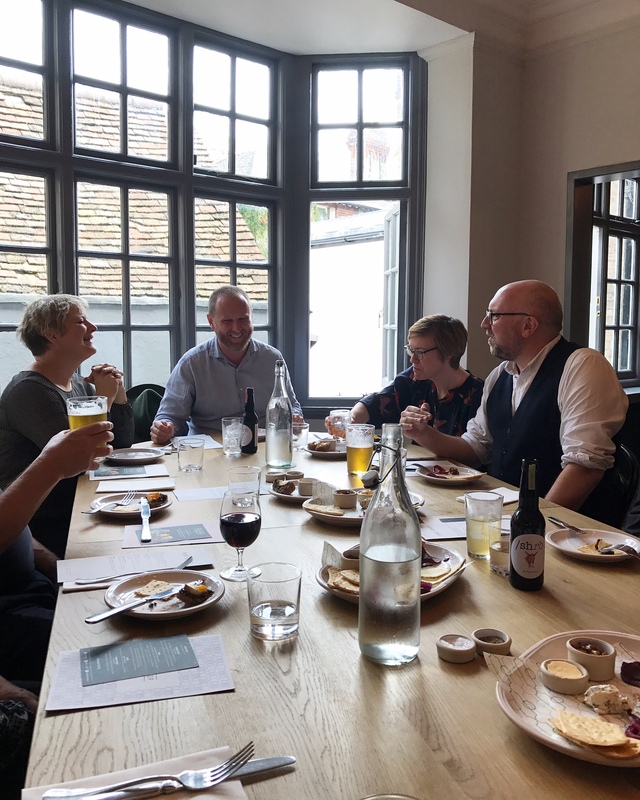 The Tasting Lunch began with a sharing platter featuring air dried smoked mutton, Berkswell sheep’s milk cheese and Silk Weavers Brain, which is Pint Shop’s homemade fresh cheese packed with herbs and aromatics. 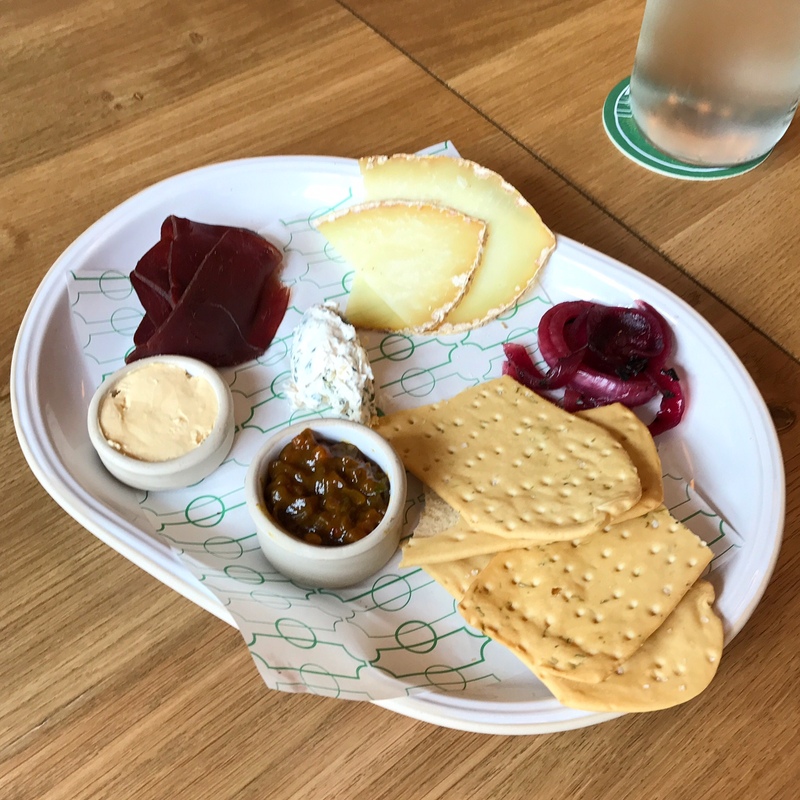 The platter was served with pickled red onions, piccalilli and sea salt crackers. 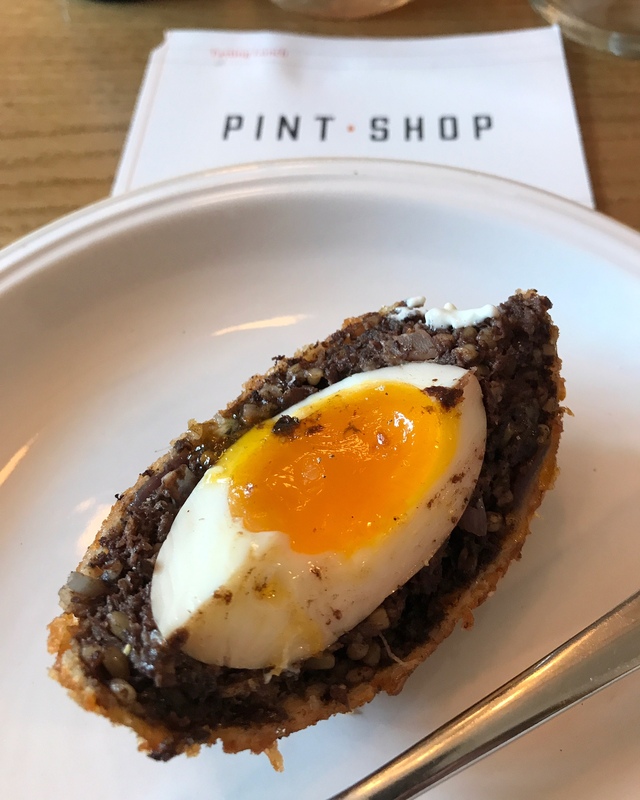 Pint Shop’s legendary scotch eggs, previously only available as bar snacks, are now featured on the main menu where they are cooked to order and served hot. The black pudding scotch egg, served with cider mayonnaise, had the requisite runny yolk and crisp golden shell. 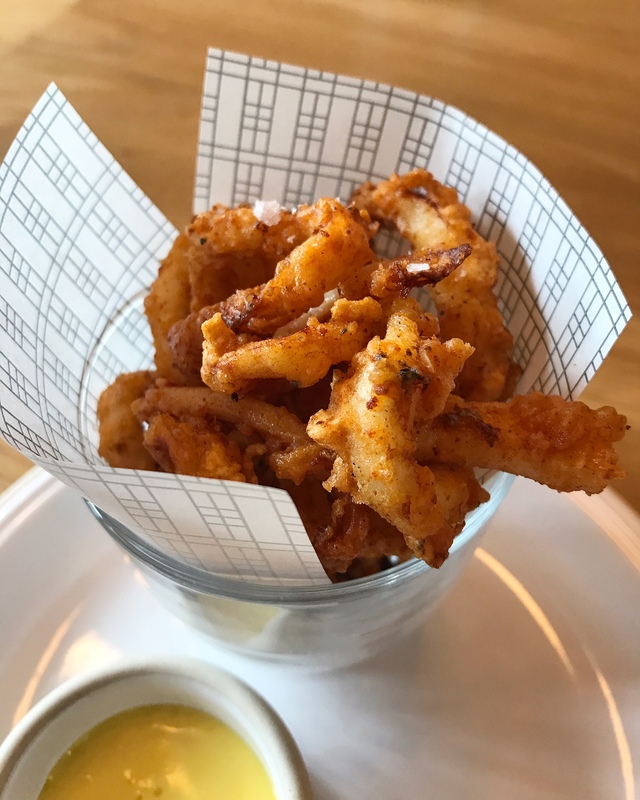 From the Small Plates section, the deep fried squid, served with capers and saffron aioli, was by far the best I’ve ever had! Tasty and crispy on the outside, tender and not the least bit rubbery on the inside. 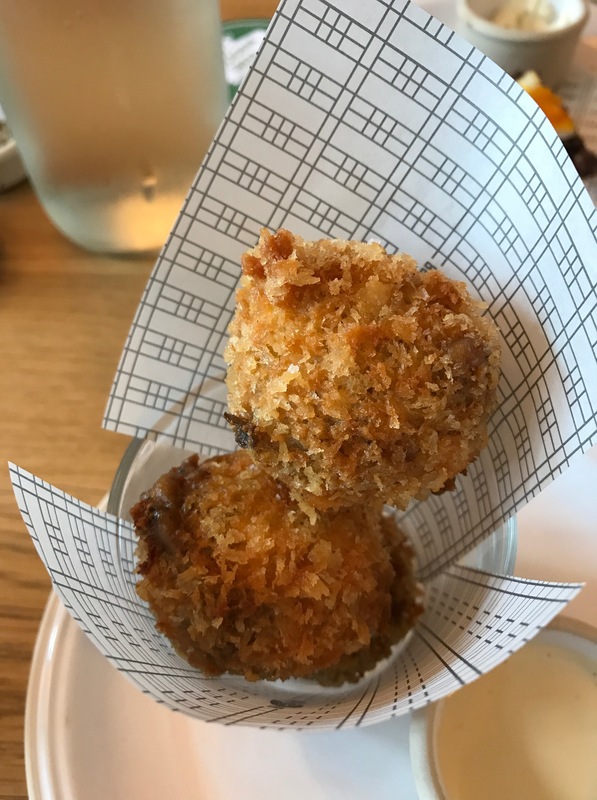 We also enjoyed mushroom croquettes served with stout mayonnaise. Addictive little nibbles! 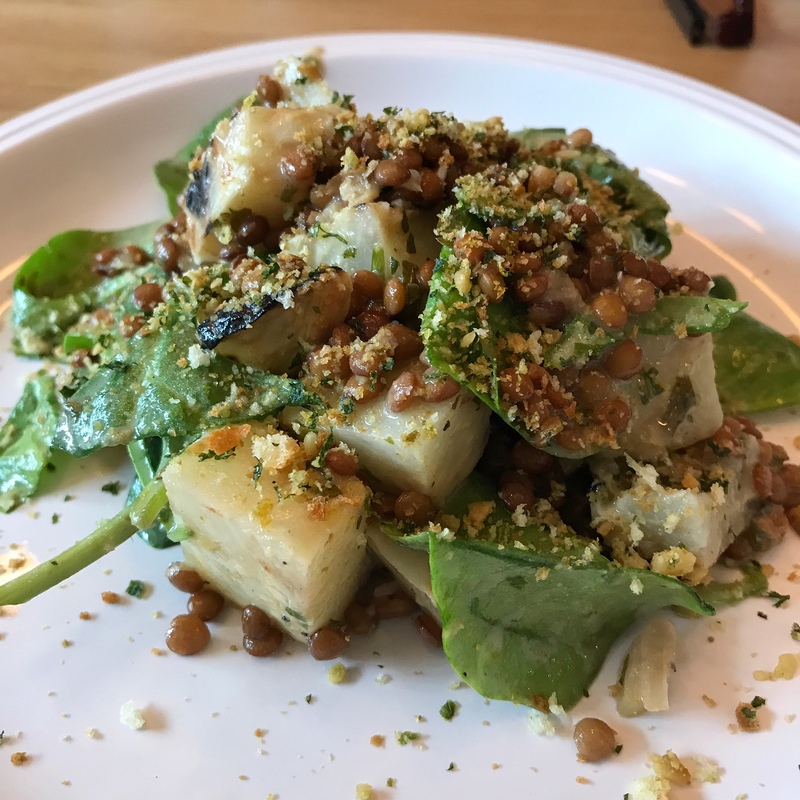 The salad featuring charred celeriac, artichoke hearts, lentils and hazelnut crumb made an excellent vegan option with nicely balanced flavours and textures. 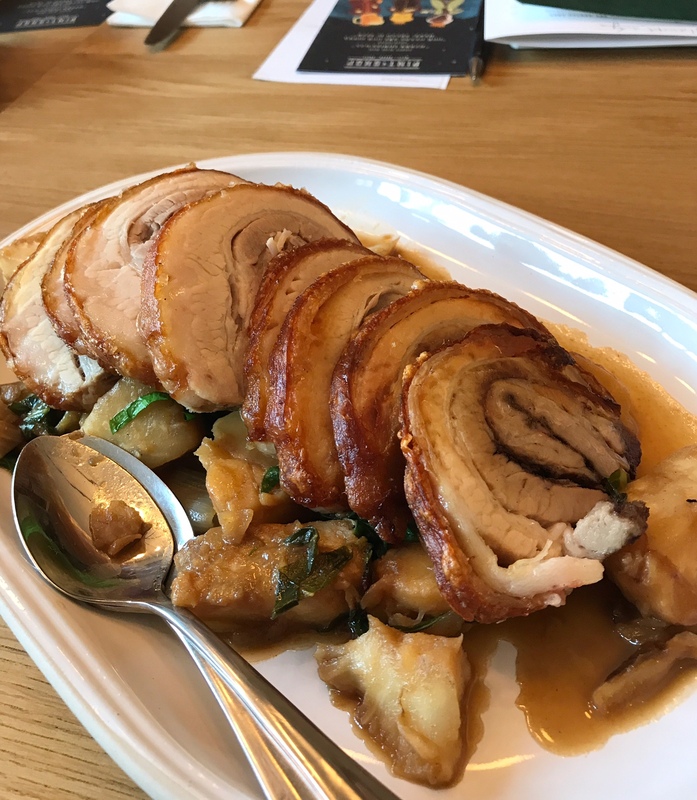 A real show stopper was the pork belly, served with slow cooked celeriac with garlic and thyme. The pork belly was slow cooked overnight (about 8 hours) and then put on their charcoal spit roast just before service to give it a good crackling while keeping the pork soft and buttery. 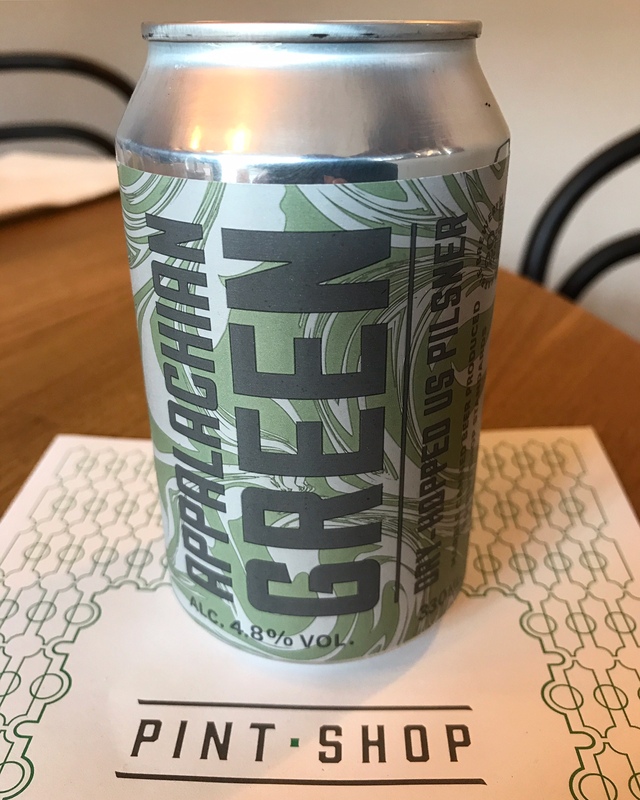 Curries are a brilliant addition to the menu as they’re a good match with beer. The Pint Shop House Curry was phenomenal. 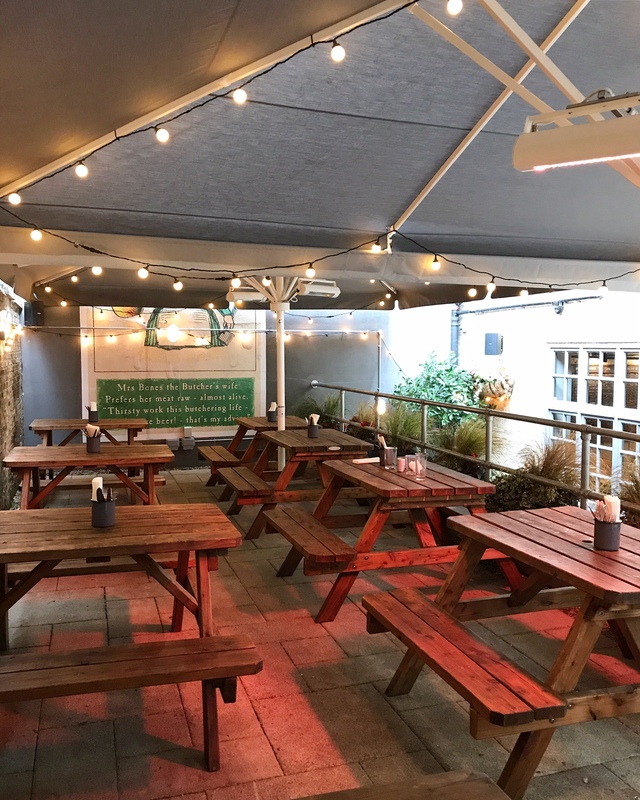 There’s a choice of king prawn or chicken tikka (we sampled the prawn). 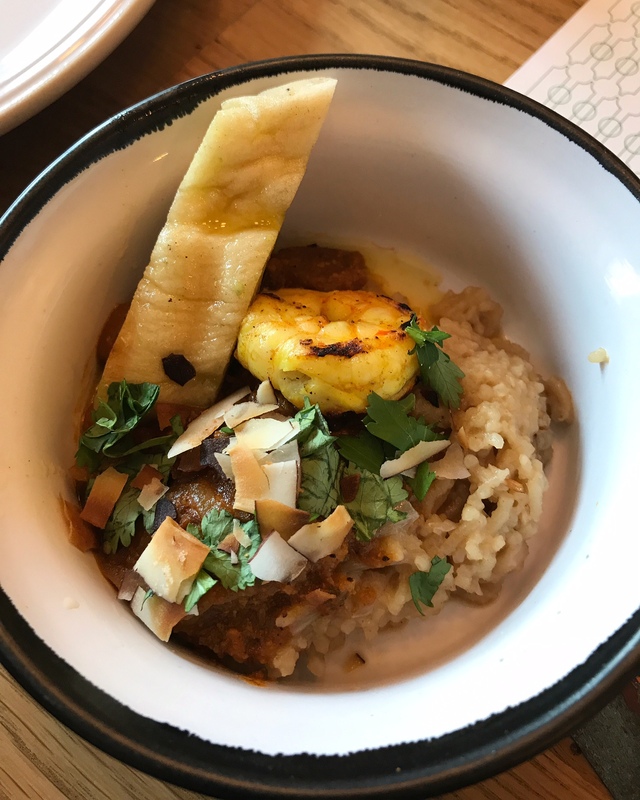 This flavourful dish comes with naan, rice and peanut chutney. 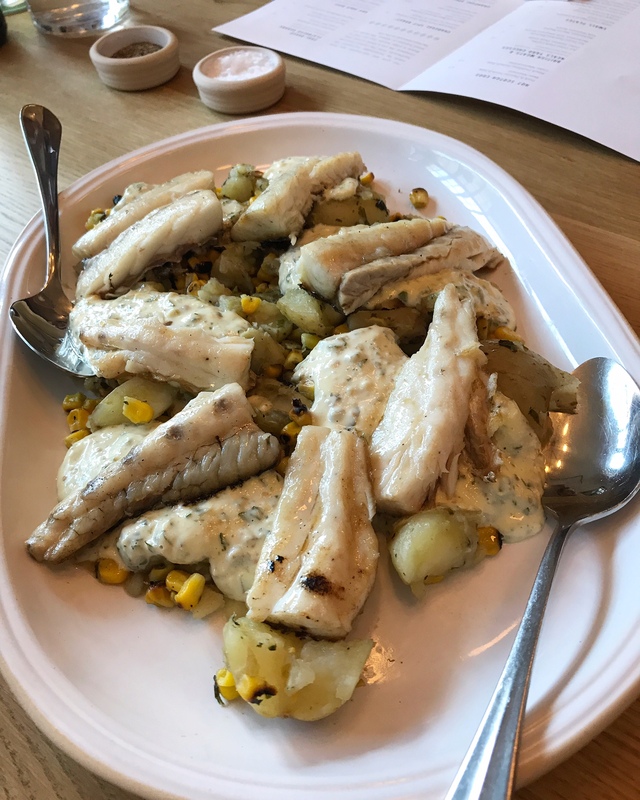 Also from the charcoal grill was the delicious grill stone bass with charred corn, potato, artichoke and sauce gribiche (a mayonnaise-style sauce with hard boiled eggs, pickles and capers). 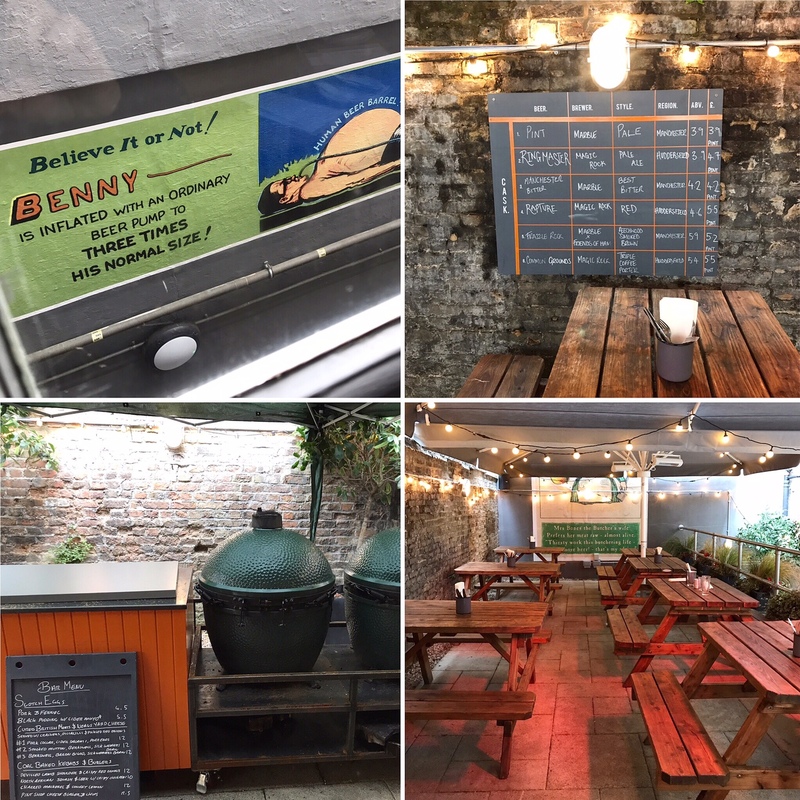 “Posh kebabs” are available in many restaurants nowadays but the first time I heard of them was when Rosie Sykes introduced these coal-baked flatbread kebabs to Pint Shop’s menu a few years ago. I’m delighted the devilled lamb shoulder kebab with crispy red onions is still around. However, there are two more kebab dishes on the menu now, one with vegetables and another with fish (mackerel). 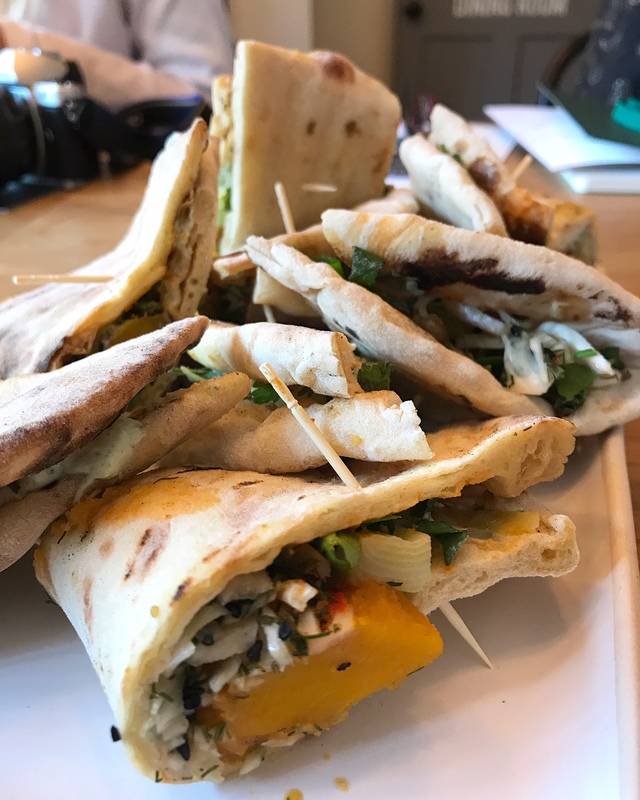 We sampled the kebab with North African squash and leek with crispy chickpeas. 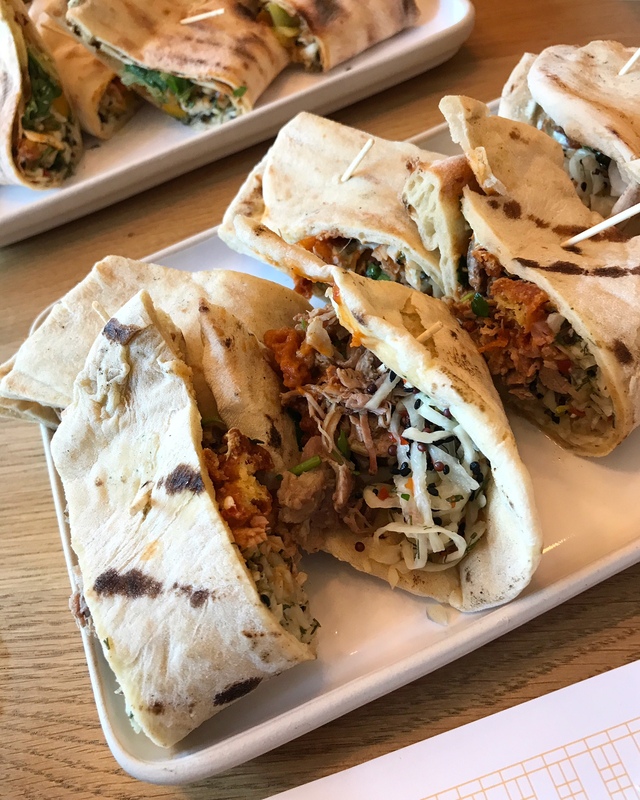 All kebabs are served with shredded pickled cabbage, mint yogurt and chilli sauce for a little kick. So very yummy! The feast of flavours at the Tasting Lunch had us craving something sweet. 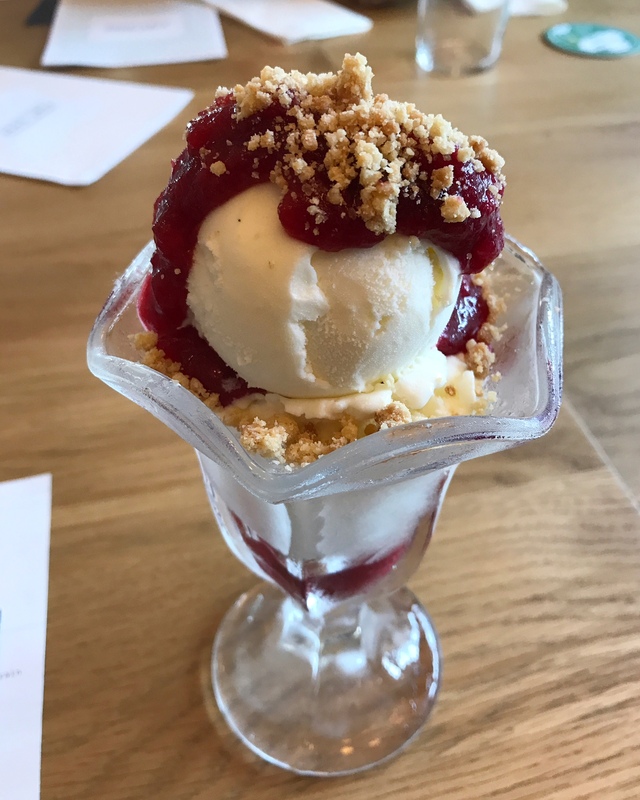 Pint Shop certainly delivered with their apple & blackberry sundae, featuring Bramley apples, blackberry compote, cardamom ice cream from Cambridge’s own Jack’s Gelato and crumble topping. 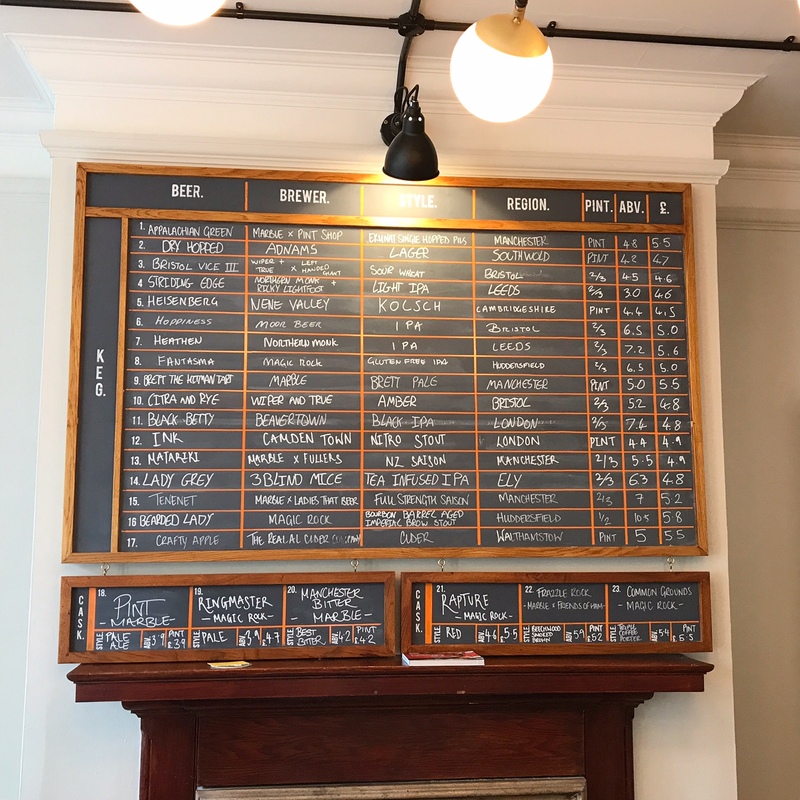 Pint Shop has always been great but the tweaks to the menu and restaurant lay out have made it even better. The bar area at the front is still the same, there are two dining spaces (one of the ground floor and another on the first), the loos have been relocated to the second floor (although there is still a disabled one on the ground floor) to create two new private dining rooms that can accommodate larger groups and there’s that fabulous courtyard garden at the back. 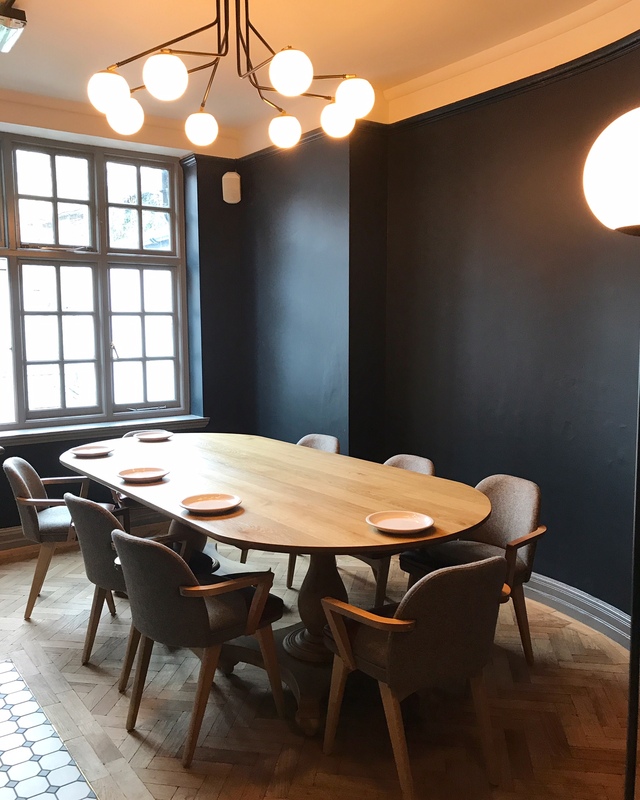 The menu features some wonderful comfort food with high quality ingredients but it’s also fresh and innovative. It keeps me coming back for more, time and again. 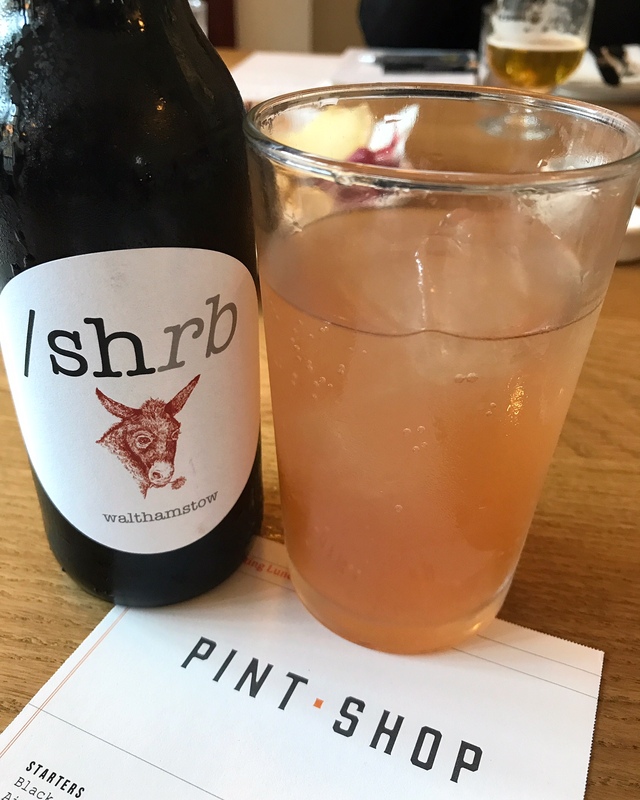 I was invited by Pint Shop to sample the new menu. 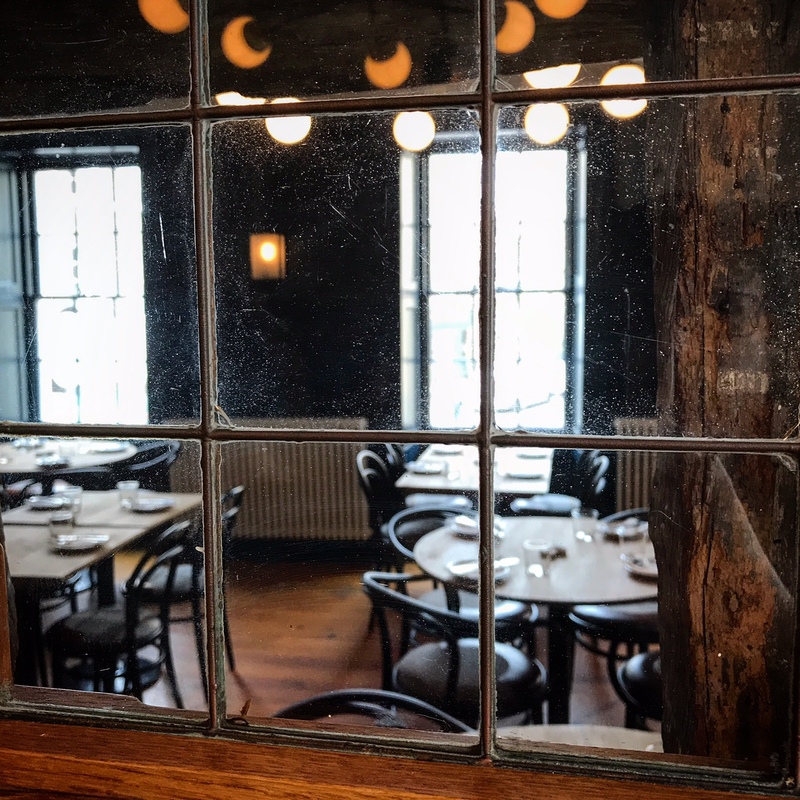 Although the food and drinks were complimentary, all views are my own. I did not receive compensation for my review. 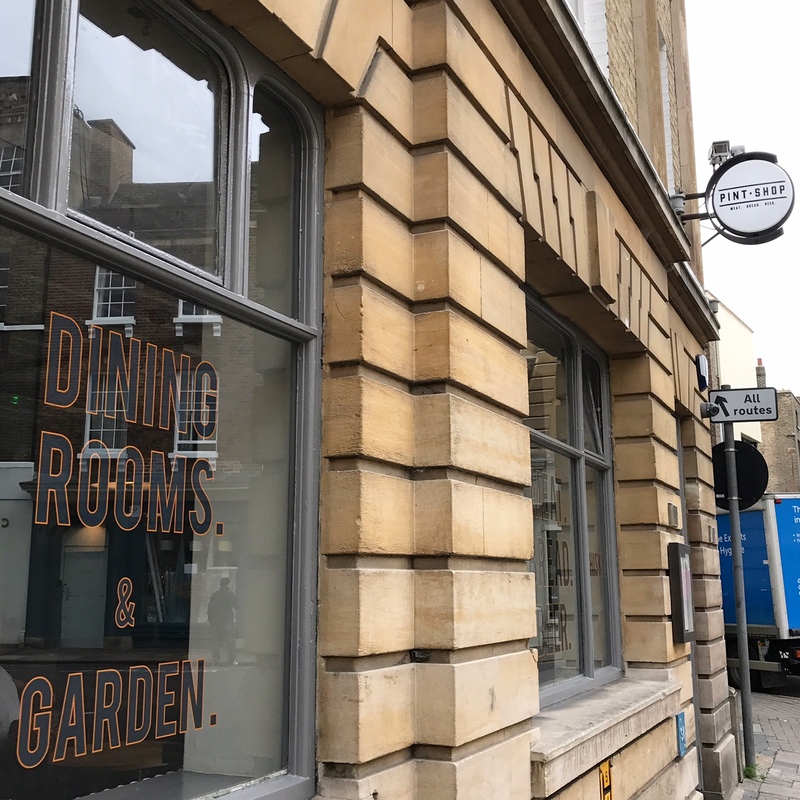 This entry was posted in Restaurants and tagged air dried smoked mutton, bass, Cambridge, curry, devilled lamb shoulder, Jack's Gelato, North African squash, Pint Shop, pork belly, posh kebabs, Rosie Sykes, scotch egg, Silk Weavers Brain, squid, sundae, vegan by One Two Culinary Stew. Bookmark the permalink.